There are many oddities in time zones. e.g. China spans the similar width and size as the USA. China chose to have one single time zone for convenience, and leave its people decide when to go to work. As a result, people in NE China go to work at 6am, while those in Xinjiang and Tibet do it at 10am. The upside is that one does not have to adjust the clock and there is no risk of missing train or plane while travelling. There is also little risk of missing phone conference. Whole of Alaska is shift 1 time zone to that of the SE strip of the capital Juneau (it is doing what China does). Perhaps also such that it is only 1 hr behind PST. France, Spain, Portugal, Algeria and Morocco went with the EU and left the UK zone. 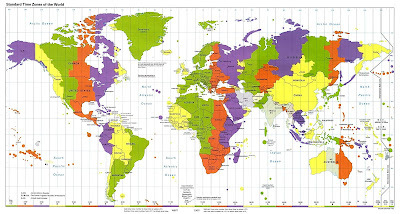 The short answer is that West Malaysia follows the time zone for East Malaysia, and Singapore follows West Malaysia. And we followed China's, Mr. anonymous?? I used to think that Chinese people are linked or united as one big entity by one language (Mandarin), similar culture, share the same history, and now has the same time zone, for the people of this region. I am just interested in what the time zone was before independence? i.e. in 1950s. back then the colonies were sort of separate, i suppose? This is a better map with much more detail and corrections. There were two different time zones before and after the independence. It was later standardized somewhere in my father's era - probably in the 60s or 70s. The move was seen as a ploy to win the heart of East Malaysians that they are also 'accepted' in some ways. This resulted in West Malaysian (better known as Peninsular Malaysia) having to wake up before the sun rise. At 6am, the sky is still dark here. Portugal is still aligned with the UK time zone.